(AP) CLEVELAND - The Rock and Roll Hall of Fame ceremony didn't miss Axl Rose at all. 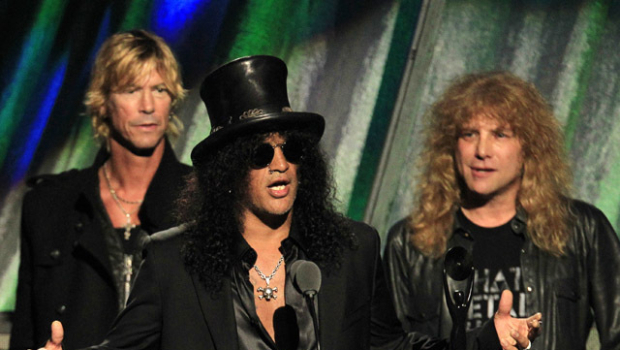 Hard rockers Guns N' Roses  minus Rose  headlined this year's eclectic group of inductees. Others being enshrined are the Red Hot Chili Peppers, the Beastie Boys, folk icon Donovan, late singer-songwriter Laura Nyro and British bands the Small Faces and Faces. Green Day, which was scheduled to induct Guns N' Roses, got things started by tearing into "Letterbomb" with Billie Joe Armstrong leading the sold-out room of fans and celebrities in a sing-a-along chorus. While their lineup has undergone some changes  founding guitarist Hillel Slovak died of a heroin overdose in 1988  Kiedis and bassist Flea have survived personal highs and lows and the band remains one of music's top live acts. Stewart came down with the flu this week and couldn't attend. Simply Red's lead singer Mick Hucknall, a friend of the band, filled in for Stewart on "All Or Nothing," "Ooh La La," and the crowd-pleasing classic "Stay With Me," with Wood, previously inducted with the Rolling Stones, delivering an exquisite slide guitar. During a speech that was at times comical but heartfelt throughout, John Mellencamp inducted Donovan, a balladeer from the flower-power 1960s once labeled "the new Dylan." Donovan Leitch had a string of hits in the `60s with "Sunshine Superman," "Hurdy Gurdy Man" and "Mellow Yellow." Instead of reading prepared notes, Donovan accepted his honor by reciting a poem  without using a script  inspired by his induction. It ended with the line: "I thank my fellow artists all." Blues guitarist Freddie King was inducted first. Nicknamed "The Texas Cannonball," the late King was one of the first bluesmen to be backed by a multi-racial band. He was welcomed into the hall by ZZ Top's Billy Gibbons and Dusty Hill. The influential Nyro, who died in 1997, never reached commercial success but wrote hits for other artists. She was inducted by singer Bette Midler, who called the New York songstress "one of my favorite artists." "I loved her the moment I dropped the needle on the vinyl," Midler said. "She influenced so many musicians. She was the very essence of New York City. Not in the gritty real sense, but in the passionate, romantic, ethereal, eternal sense." Linda Rondstadt has never even been nominated, so this whole thing is a farce. Not really a fan, are you? Tom Petty guitars stolen in Southern Calif.
Geithner: Romney's statements on women "misleading and ridiculous"
02Midwest tornadoes: 5 dead, 29 hurt in Okla.
03Geithner: Romney's women statements "ridiculous"
04What happened to Jamie Laiaddee?